Motherwell Football Club was formed from an amalgamation of two factory based amateur sides, Glencairn and Alpha. In 1886, a charity cup was organised between a side from Glasgow and select side chosen from the two sides. There were suggestions that the two clubs should amalgamate and indeed on 17th May 1886 representatives from the two sides met and Motherwell Football Club was born. Motherwell continued playing home games at Alpha’s Roman Road pitch and it was there that Motherwell defeated Hamilton Accies 3-2 in their first game. In 1889, Motherwell moved from Roman Road to allow housing development. Dalziel Park was the name of the next home ground and in the first game there saw Rangers being held to a 3-3 draw. In 1893 at the club’s AGM, it was decided that the club should turn professional and When the Scottish League formed a new Second Division, Motherwell were one of ten clubs elected in the first league game, Motherwell defeated Hamilton 4-1. In 1895, Motherwell moved to a piece of land on the northern edge of Lord Hamilton’s Dalziel estate called Fir Park. Eight thousand spectators saw Motherwell’s first game against Celtic, the away side won 8-1. In season 1902/03, the ‘Well finished runners up of the second division and were promoted to the first division. In season 1912-13 for the first time Motherwell turned out in Claret and Amber, blue had been previously worn. It was said that the new colours were the racing colours of Lord Hamilton of Dalziel but that myth seems to have been debunked and it was more likely the club were inspired by the English FA Cup winners Bradford City. 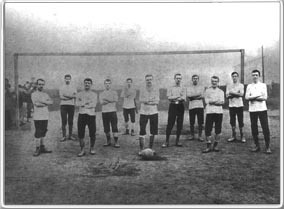 The Motherwell team of 1886, comprised of the best players from Glencairn and Alpha, who are pictured at the original ground Roman Road. From left to right the players are: William Sneddon, Tom Gray, Robert Sharp, James Murray, James Irvine, James Wilson, James Charteris, Tom Sharp, William Moodie, William Charteris and James Cassidy. After the First World War, Motherwell began to establish themselves as more of a force in Scottish Football with John ‘Sailor’ Hunter at the helm, reaching the cup quarter-finals on five occasions before being semi-finalists in 1923, and finishing in third place in the league in 1920. Motherwell’s greatest period began in the 1926/26 season and for the next seven seasons they were always in the top three and in the 1931/32 season, Motherwell, for the first and only time (so far) won the Scottish League finishing five points clear of second placed club Rangers. In that season centre forward Willie McFadyen scored 52 goals in a single season gaining the Scottish League record. During that period Motherwell’s formidable front five of Bobby Ferrier, George Stevenson, Willie McFadyen, John McMenemy and John Murdoch terrorised the Scottish defences. In 1931, 1933 and 1939 Motherwell reached the Scottish Cup final, but they were defeated on all three occasions. In 1931 Celtic defeated Motherwell 4-2 after a replay, the first game having ended 2-2 after Allan Craig scored an own goal in the dying minutes. In the 1933 cup final Celtic won 1-0. In 1939, Motherwell were defeated heavily by Clyde, 4-0. At the end of that season, both the Scottish League and Cup were suspended due to the outbreak of the Second World War. After the end of the war, in 1946 the Scottish League started up again and in the first season under the new management of former player George Stevenson as John Hunter moved upstairs, Motherwell finished 8th in the league. In 1950/51 Motherwell became the third club to win the League Cup in its fifth year, defeating Hibernian 3-0 with goals from Jim Forrest, Archie Kelly and Willie Watters. That season, Motherwell again reached the final of the Scottish Cup but they were defeated 1-0 by Celtic. The next year in their fifth final, for the first time, Motherwell won the Scottish Cup, after ten matches Dundee were comfortably beaten 4-0 by Motherwell with goals from Wilson Humphries, Archie Kelly, Willie Redpath and Jimmy Watson. In 1954, Motherwell reached the League Cup final for the second time, but despite goals from Alex Bain and Willie Redpath, were defeated 4-2. 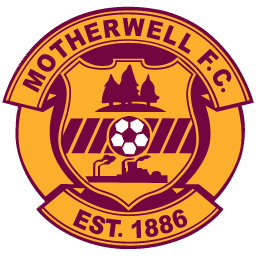 During the 1950s despite the good cup form Motherwell were not a good league team, finishing mid-table for most of the fifties and being relegated in 1952/53 season although immediately promoted the following season. However, nearing the end of the 50s Motherwell started some good league form and in season 1958/1959, Motherwell did manage to finish third in the league. In 1965 Bobby Ancell took over and built the famous ‘Ancell Babes’ including players like Charlie Aitken and Ian St John. In 1962, Ian St John was transferred to Liverpool and the money generated from the transfer was used to build the Main Stand at Fir Park in place of the tiny Grandstand. The bare girders at the Southern end still bear testament to the property owner who obstructed its completion. After Bobby Ancell left in 1965, Bobby Howitt took over and results started to slip until Motherwell were relegated in 1968. However Motherwell were immediately promoted the following season. During the early seventies, Motherwell participated in the Texaco Cup in which teams England and Scotland competed. This saw ‘Well record memorable wins over Stoke City and Tottenham Hotspur. Ian St John became manager in 1972 and during his three year stint Motherwell finished mid-table. Willie McLean took over in 1975. The Scottish First Division became the Premier Division and in its first season in 1975/76 Motherwell finished fourth and for the next two season finished mid-table before being relegated in 1979. This period saw many talented players playing in the ‘Well team, which included the likes of Pat Quinn, Willie Hunter and Andy Weir in the 60s and Willie Pettigrew, Bobby Graham and Joe Wark in the 70s. These teams were hugely popular with the fans. Between 1978 and 1984, for six seasons several managers came and went, including Roger Hynd, Ally McLeod, David Hay, Jock Wallace and Bobby Watson before Tommy McLean was appointed in 1984. In his first season, Tommy took Motherwell back to the Premier League and the Scottish Cup semi-finals, where the ‘Well were defeated by Celtic 3-0 in a replay. In 1991 Motherwell, for the second time, the ‘Well defeated Aberdeen, Falkirk, Greenock Morton, Celtic and Dundee United to lift the Scottish Cup. Goals from Ian Angus, Phil O’Donnell, Iain Ferguson and super-sub Stevie Kirk, who managed to score in every round, scored the winner in extra time. After the cup win, McLean lost a number of key players and was forced to rebuild his squad. In season 1993/94, Tommy resigned and Alex McLeish took charge. He took Tommy’s squad to second in the league and a place in the UEFA Cup for the second year running. As Tommy McLean’s squad started to disappear, the results soon followed. The team struggled for the next two seasons and in season 1997/98, ‘Big Eck’ moved to Hibernian. Finnish manager Harri Kampman took over as manager. John Boyle bought the team and a disagreement with the manager saw him go back home. He appointed Billy Davies who spent a fortune on players such as John Spencer, Andy Goram and Don Goodman. In April 2002, due to financial difficulties, Chairman John Boyle reluctantly placed the club into interim administration. Nineteen players were let go and manager Eric Black resigned. His assistant Terry Butcher took over and due to the mass exodus, the youth were given a chance and they did not disappoint. Real gems were unearthed such as James McFadden, Stephen Pearson, Stevie Hammell and David Clarkson. The team was performing but inconsistently. Motherwell managed to record memorable wins over Celtic 2-1, Rangers 1-0, Livingston 6-2, and Hearts 6-1 and get to the Scottish Cup semi-final but were narrowly defeated 4-3 by Rangers. However they still managed to finish bottom of the league but were saved from relegation thanks to Falkirk, who won the first division not having a compliant stadium. The following season, ‘Well star James McFadden signed for English Premier Team Everton. Terry Butcher signed Gordon Marshall and Jason Dair along with former ‘Well stars Alex Burns and Stephen Craigan. Four experienced pros to add to his young stars. Under the helm of Terry Butcher with his mixture of raw young talent and experienced pros the future looks bright for Motherwell Football Club.